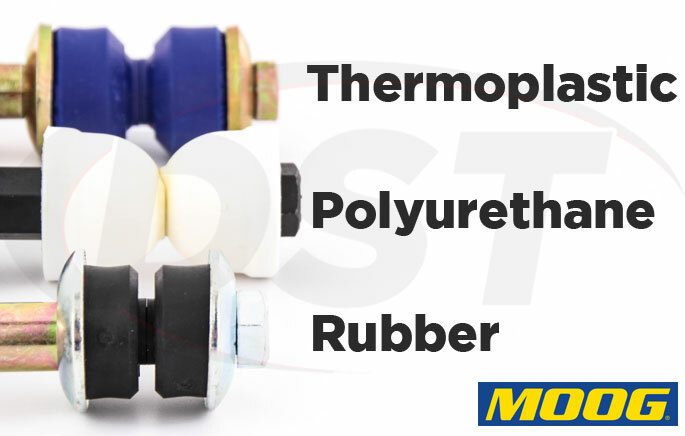 Moog front sway bar end links will restore the connection between the sway bar and the wheel assembly, improving your turning and handling. Find front sway bar end links for your vehicle below. When the end links are worn you will notice a clunking or rattling noise (especially over bumps), loose steering, and your vehicle just won't handle like it used to. These symptoms or even just a visual inspection of the end links can reveal that they are worn, bent, or the rubber grommets could be missing altogether. Moog replacement sway bar end links can restore the handling of your vehicle and their premium options will last much longer than the originals. Their bolt style end links range from economical Rubber grommets, to a step up in durability with Thermoplastic, to the most durable and handling enhancing Polyurethane. Moog also manufactures Ball Joint Style End Links that replace worn or loose originals and get your handling back to normal. * If you're having trouble finding exactly the right size or style you can check out Moog's universal sway bar end links which have exact measurements so you can find the part you need.